RT40RR - The Les Durrant Collection! 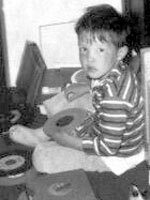 Les Durrant at four years of age - born to play with records! 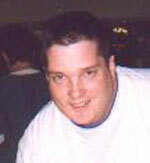 Les Durrant was born in 1964, in Northern California, the son of a Navy Airman. His family moved around quite a bit, but his early years were spent mainly on the island of Guam, where he got his first taste of radio. For a project in the Cub Scouts, his Mom took him to the Navy radio station on the base (AFNG) and he was hooked. When he returned to the States in 1974, they stayed near San Francisco and his favorite radio station became KFRC. By 1980, Les was in Utah while his Dad attended school. He got his first radio job at a station in Tooele, Utah, playing the Sunday morning church shows, but he "got to give the time and temp, so it was cool." His family finally settled in Lubbock, Texas where he pursued his radio career on three stations at once (Big Band KKAM, and adult contemporary stations KWAZ and KSEL.) Les stayed in radio until 1984 and then he became a Club DJ for several years, off and on. Currently, Les works for a "great company doing workforce management." He misses his days on the mike, and hopes you enjoy his Collection. The Repository thanks Les Durrant for sharing!
. . . the American Band - you can tell, they got their uniforms on . . . Here's Charlie Fox on KXKX-FM (96 KX) Denver, Colorado, circa 1977. This tape was given to me.
. . . they sent me the Batwoman logo, I like the bottom part of that a lot . . .
More to Come from the Les Durrant Collection! Reel Top 40 Radio Repository ©1996-2002 REELRADIO, Inc.